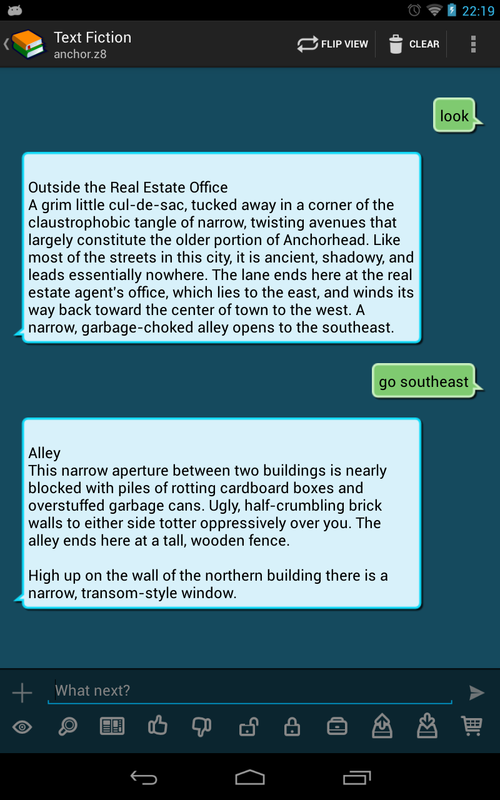 Text adventures are a genre of computer games in which the player typically explores a fictitious world through an alter ego. Playing a text adventure is similar to reading a story, but being able to make own decisions, solve puzzles and potentially influence the outcome. When open the app for the first time, you will be greeted by the library screen. It is initially empty and waiting for stories to be imported. To import a story, choose Browse Catalog from the menu. This will open the list of available text adventure games in your default web browser. In case you never played a text adventure before, you probably want to give the tutorial a try or play Zork. After choosing a story, just tap the Play this! button under to story description to start the download. Once a story is finished downloading, go to your Downloadmanager and open it. Depending on your version of Android/your webbrowser, this will automatically start the Text Fiction app and import the file int to. In case it doesn’t, or in case you want to mass import multiple story files, open the Text Fiction app and select Import from the menu. After a story is successfully imported into the library, the according file can safely be removed from the Downloadmanager. 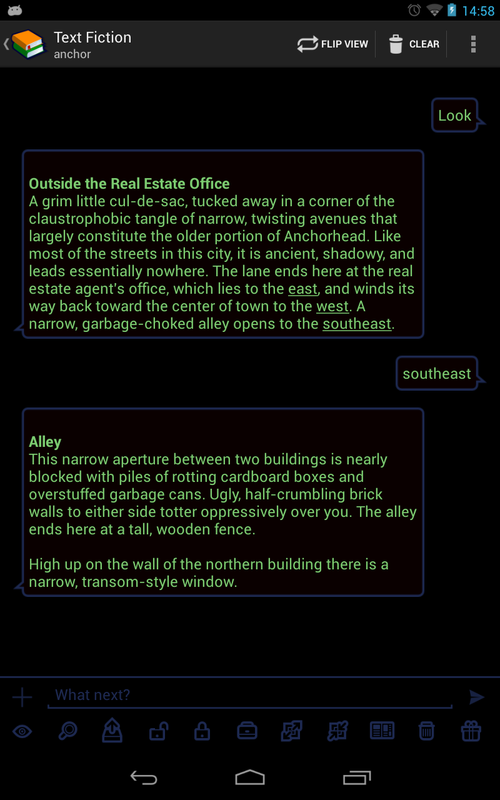 Text Fiction is designed to look and feel like an instant messenger app. That is, you text your alter ego a short command (e.g. “go south”) and the game reacts by immediately texting you back the result (e.g. the your alter ego leaves the current area by the south exit, then describes the new whereabouts). The message area is where the story unfolds. The player commands are shown in the chat bubbles on the right, the game’s reaction to them are on the left. Both are touch sensitive! Words can be copied from either into the commandline by touching them. Touching empty space will delete the last word from the commandline. Long pressing a word will toggle highlighting (useful for quickly spotting things like exits). The borders of the message area are touch sensitive as well and can be used for moving the player character in the according compass directions. The bottom part of the game screen belongs to the command box. Here you text commands to your alter ego. However, it is rarely necessary to actually bring up a keyboard at all. Instead, you can simply build a command by touching the verb icons and words in the message area. The interface is smart enough to figure out the correct order of words, so it doesn’t matter whether you start building by touching a verb icon or a word in a chat bubble. The + button on the left brings up the game menu (use it to save/restore games). The > button on the right will submit the current command. 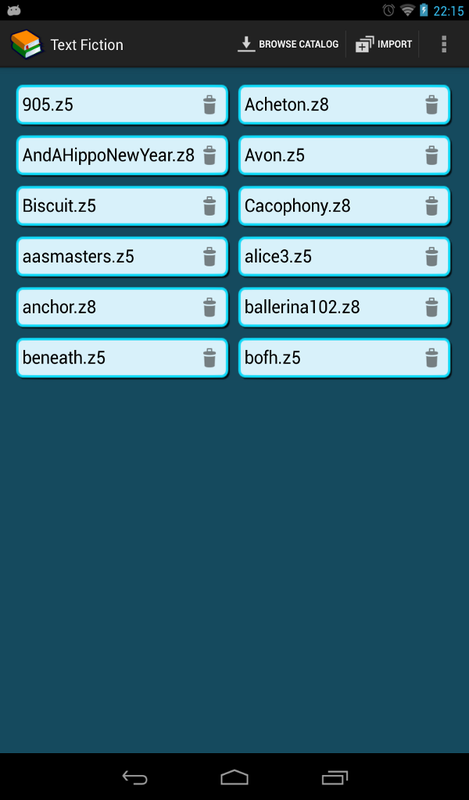 Text Fiction isn’t merely a port of the Z-Machine to Android, it is fully adapted to the capabilities of Android and comes with a couple of features not found in traditional TERPs. Most of them can be tuned from the settings screen (available from the menu on the library screen). Several different color schemes are available, all named after major characters in classic literature. The default one is called “Nemo” and meant for normal light conditions. The Mina and Lucy skins are designed for playing in low light environments. Finally, there’s also “Jason” which is meant to accommodate players who prefer a traditional appearance. On small screens, reading longer messages may prove to be challenging. For this reason, Text Fiction employs Android’s Text To Speech engine to automatically read new messages out loud. Narration stops whenever blank space in a chat bubble is touched. The verb icons are all (re)configurable. To change an icon, first put the new command on the commandline, then long press a glyph to associate it with. This will bring up the edit dialog. The same thing can be done for the touch sensitive borders of the game screen. Text Fiction automatically saves the current game when you navigate away from the game screen (e.g. when you take a phone call). It does, however, not automatically restore your game. You have to do this from the game menu (+ symbol). Whenever you restore a game, the message area will automatically be cleared. In order to write a story that can be played in Text Fiction, you will need a PC and the Inform 7 authoring tool (available for Linux, Windows and MacOS). Check the video below for a short introduction.